A total of 120 children took part in the competition on synthetic pitches in Chervonohvardiyskyi district. All of them train in that district and at Shakhtar’s central stadium in Donetsk. The kids were divided into two age groups (from 6 to 10 and from 11 to 13 years old) and held the group stage games previously, which had determined the finalists. In Saturday’s deciders, the participants competed for the top spots. In the U10 age group, Terrikon team claimed the third spot. In the final, the Eagles beat Uholiok 3-2 and have won the challenge cup from FC Shakhtar. In the older age group, Yuzovka team were the strongest, thrashing Olimp 4-1 in the final. The bronze medals went to Vympel team. - I ‘ve been engaged in the Come on, Let’s Play! project for three years now, - says Bohdan Shapkin, who became the best player of the tournament in the U13 category. - Most often I play on the left wing in midfield. At this tournament, I managed to score six goals. I am very pleased that they picked me as the top player, but at the same time we have a great team in general. We are friends and train together all the time, although we attend different schools and have met in the project. I really like the Come on, Let’s Play! competitions, with every training involving lots of interesting stuff. 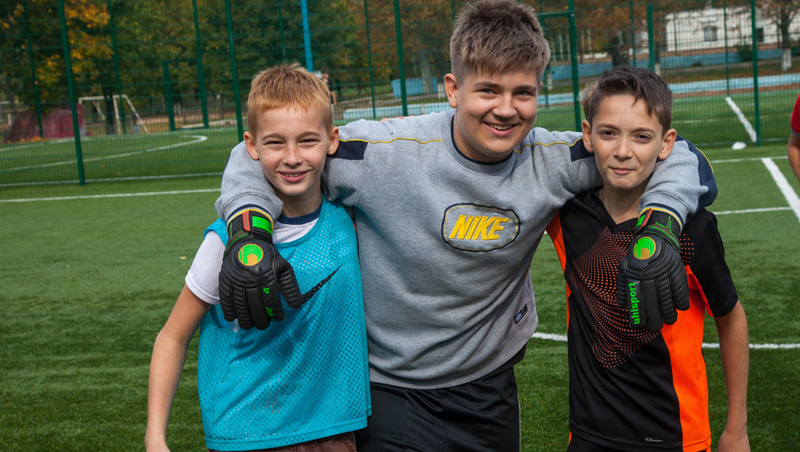 We want to add that in the older age group they picked Danylo Andreev as the best goalkeeper. In the U10 group, Danylo Redchuk was voted as the top player, with the best goalkeeper award going to Yegor Demchenko. - A good tournament! Such competitions give you only positive emotions. Not always children can make it to the academy, so for many of them it’s a kind of stimulus to grow. They train, play football, talk and become friends, which is very important. Of course, I would like to see as many children fully engaged in physical activity as possible. It’s vital to develop the child physically! So this project is very important. Let us remind you that the Come on, Let’s Play! project has been very popular in Donetsk and Makiyivka for a few years now. In October 2015, the FC Shakhtar project was also launched in Lviv, as well as in Kramatorsk in the summer 2016. Children in those cities attend training sessions and become participants of the competition.